For now I think we'll just eliminate the "What Went Wrong" and "Turning Point" categories in losses and immediately begin with the pitching lines since the starting pitching and the losing pretty much go hand-in-hand. Put me in the camp who believes calling up Cabrera was a silly decision from an organizational standpoint and not fair to the young man at this point in his development. I indicated that feeling in the Lineup Card this afternoon, and his performance tonight only made the feeling stronger. He just wasn't ready for the challenge and looked overwhelmed from the get-go. I think the results and the photo below bear that out. 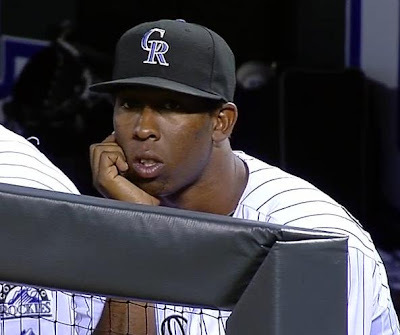 With the Bob Apodaca news breaking yesterday, I neglected to mention the Rockies recalling 24-year-old left-handed pitching prospect Edwar Cabrera, while shipping the struggling Alex White back to Colorado Springs. Cabrera will make his major league debut tonight against Washington, and then enter into the circus known as the Rockies four-man rotation. And I'll be honest, I think this is a really awful way to acclimate a young pitcher you'll be counting on for years to come into the big leagues. But hey, (sarcasm) look how well it's working for White and Christian Friedrich (/sarcasm).